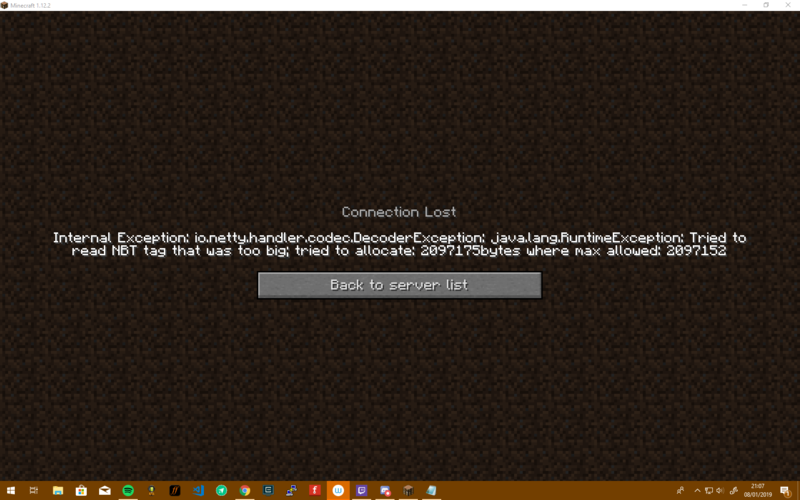 My plot has some droppers that are filled with droppers and they are crashing me because of nbt read sizes so, could my plot be like rolled back from before "20:59" GMT on the 8th of the 1th of the 2018th. If its not able to be done can you just clear my plot because I have most of my stuff stored in schematica anyway. you want it rolled back a year? I just went to your plot and didn't crash. Are you sure this is on your plot? Edit: Are they the 5 droppers near that redstone build? If yes I removed them. (01-09-2019, 06:19 AM)LambdaPI Wrote: I just went to your plot and didn't crash. Are you sure this is on your plot? Im still having the same problem when connecting, is it possible to clear my inventory?